I have a very small, but completely adorable Yorkshire Terror named Cocoa. 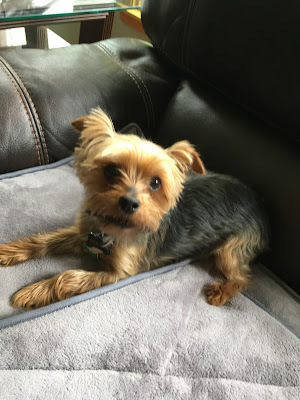 He is around 7 /12 lbs., but he is amazingly cute, agile and the King of the Castle. He does not seem to like his dog beds, instead preferring to sleep with mommy and daddy. 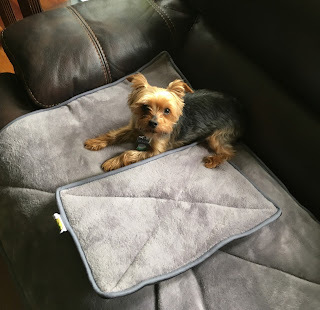 When I was offered the opportunity to review this product, I said this will be great, because I am sure the reason Cocoa doesn't like to sleep alone is that he is cold. He is very tiny and he gets cold, even in the summer. He loves to lay on someone or next to someone. 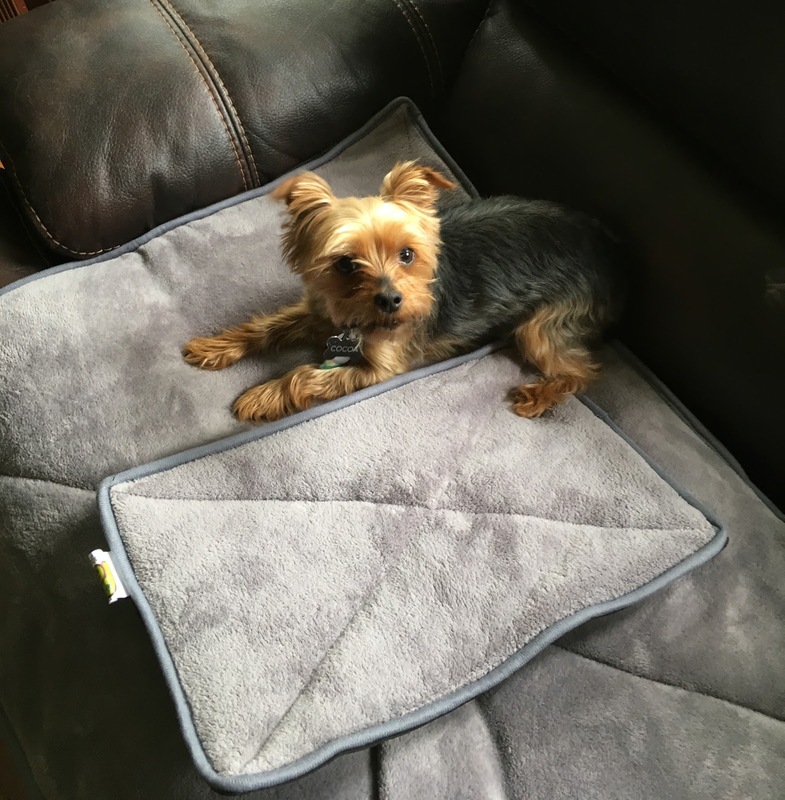 The Pet Magasin Self Heated Dog Bed includes two mats: 1 large (28.5" x 34.5") and 1 small (17" x 11"). They are self heating. You have to actually get your dog to sit on them long enough to activate the self heating portion. 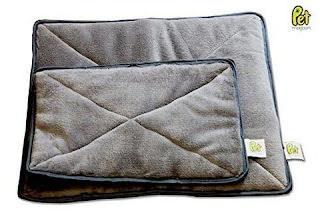 The mat absorbs, holds and reflects your pet's body heat and insulates them from cold floors. These mats are super comfy. 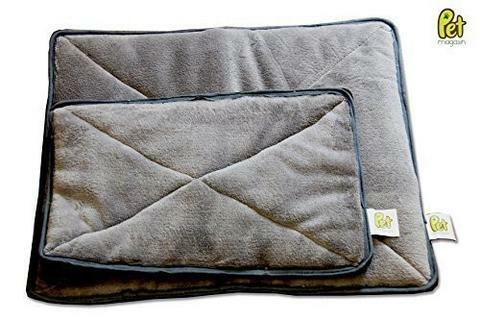 A velvety cover on top and padded with thick, soft, hypoallergenic foam that will stay springy for years. The dog beds are super comfy. The underside is rubberized so they stay where you put them, and won't be a slipping danger if someone steps on them. That is a huge plus in my book. Here are photos of my dog Cocoa on the dog bed. We have it up on the couch so it would be easier to photograph since I cannot bend my back over. As you can see, I just got him to sit here for photos. But he did use the dog bed a few nights that it was cold. I just locked him out of our room that night and he was forced to use it. In the morning when I came down, I played with him a little and I could feel how warm the dog bed was. Dogs have normal body temperatures that run about 2°-3° Farenheit higher than ours. So the dog bed would be naturally warmer than my skin. It was, it felt very warm, around 101° Farenheit. He likes the bed but will only use it at night and only when forced to do it because he cannot sleep with mommy and daddy. You have to give him credit, Cocoa knows what he wants. I think this is a great idea for a dog bed and it will be especially welcome in the cold winter months here when it gets to -20° below zero. I am sure he will have on a sweater AND be on the dog bed at the same time. He gets so cold in the winter. His har is like thin silk. The poor thing freezes in winter. This will be wonderful for that time of the year. I think the idea in general is wonderful. Some dogs, like mine, are just naturally cold. Trust me, it is a great product. I don't recommend many dog products, because a lot of them are not worth the money, but this one is.